The funny thing about wedding fashion: The design of a bride’s dress allows the bride to wear it once on her wedding day. The design of a groom’s wedding suit or tuxedo, on the other hand, allows him to wear it many more times past the wedding day (to business events, galas, and other special occasions). This is why a growing number of grooms are purchasing their wedding suits instead of renting: they get to keep what they pay for. 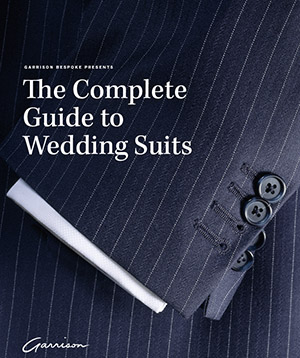 There are three different ways to get a wedding suit. Let’s go over why made-to-measure and bespoke are the groom’s best options. What is the difference between each type of wedding suit? When choosing the type of suit to wear on your wedding day, it simply comes down to: how much control do you want? Here’s Ryan in his custom suit. Check out Garrison weddings here. 1. Bespoke (full control): The groom’s choice to be the best he can be. Here the groom’s have 100% control. Stylists typically take over 50 measurements for each groom. They also make newly created paper patterns to resemble the groom’s body. Personal style consultants will consider the groom’s skin tone, hair colour, and overall demeanor as they help prepare the groom for his wedding suit or tuxedo. Grooms get to choose different fits, different styles, and different style aspects (linings, lapels, fabrics, pockets, etc.) that they want – or add details that compliment the theme of their wedding! If a tailor is calling himself or herself bespoke, then they should be working with clients one-on-one to create a wedding garment that looks and feels amazing. No paper patterns should have been pre-manufactured and everything should be hand crafted throughout the tailoring process. Lastly, Bespoke is an excellent choice for men with unique bodies that don’t fit factory sizes. It’s also a great option for the groom who has preferences on the styles, colours, textures and overall feeling of the wedding suit they’re going to wear on their special day. For example, would the groom prefer a narrow, pin, or tab collar? Would he like a specific colour of lining to match the wedding theme? Would he want his suspenders to match his jacket lining? No detail is ever too small when it comes to Bespoke. Personalized paper patterns of the groom’s body dimensions. The groom’s dimensions are kept on file for future visits. The largest selection of fabrics including limited edition fabrics. Hidden fabric left inside the suit to adjust as the groom’s body changes. Due to the care in the craftsmanship, the suit (or tuxedo) will last much longer. Requires the most time and money but allows for total customization. Fit to the groom’s body shape whilst drawing attention away from flaws. It’s always 100% tailored to the groom. (Multiple fittings take place throughout the construction process to ensure that the suit will be a perfect fit). Historically, all suits were hand made. Well-to-do men would hire tailors to custom make their clothing, and those with little money would get the family unit to make their outfits. It wasn’t until the industrial revolution that mass manufacturing became affordable. This lead to a clear distinction between factory made, and high quality handmade products. 2. Made-to-Measure (partial control): A great alternative to Bespoke. These suits have pre-prepared paper patterns ready to be put together. All the groom has to do is choose what style he wants and get his measurements taken. For made to measure wedding suits and tuxedos, tailors will discuss the groom’s preferences and style, then take the groom’s measurements to find the right pre-made patterns that fit his body. The suit will then be put together using these measurements and one-on-one fittings will take place to make necessary adjustments. Made-to-measure allows greater control and can fit the groom well, but the patterning isn’t made especially for him and he does not get to choose every single aspect of the suit. The results can be great, but it’s not exactly the unique wedding suit experience that bespoke can offer. Requires some time and some money. (About 5-6 weeks vs 10-12 weeks for bespoke). Retain some control (involving fabric, a few details and the groom’s measurements). Conforms to a mass-produced, generic template to produce the groom’s garments. This is the cookie-cutter type suit. It comes in standard factory sizes and quality ranges depending on the retailer. It’s fairly cheaper (depending on the brand), easy to obtain and makes shopping for the wedding day quick experience. These wedding suits and tuxedos allow room for minimal tailoring. This means that the feeling and fit of the suit is not going to be exceptional. A small fraction of the male population can fit perfectly (or almost perfectly) into these prototypes. They can look great in these suits and tuxedos with few adjustments. However, most men have unique builds that require made-to-measure or bespoke fittings to truly look and feel their best. If the groom can look great in these pre-made outfits and is confident enough to rock a generic style, then off-the-rack may be an option worth considering. However, if the groom and bride are not willing to sacrifice quality and uniqueness, then made-to-measure or bespoke options will be the way to go. Save time and save money (About 3-5 days if you are getting it altered vs. 5-6 weeks for made-to-measure). Sacrifice control over the extra details and measurements. Limited alterations: chest, waist, sleeves, hemline, and trousers. Generally lower quality (overtime machine stitching becomes undone and the feeling of the suit will fade). Taking the off-the-rack route doesn’t necessarily mean spending less money, depending on the quality and retailer. To conclude, none of these three options are for everyone. It will be up to the bride’s and the groom’s personal preferences. If they want to trim costs a little and are willing to sacrifice aesthetics, then that’s the time to go for “made to measure”. Lastly, if they find that the groom’s off the rack wedding suit can be tailored well to his body or if they don’t mind the generic look, then going “off the rack” will definitely be the most efficient and effective route for the couple. Speak to one of our expert stylists on the differences between bespoke, made-to-measure and off-the-rack wedding suits. Download our latest eBook, a free 50-page guide on the 11 suits every man should know.